Translate words without ever opening a dictionary. 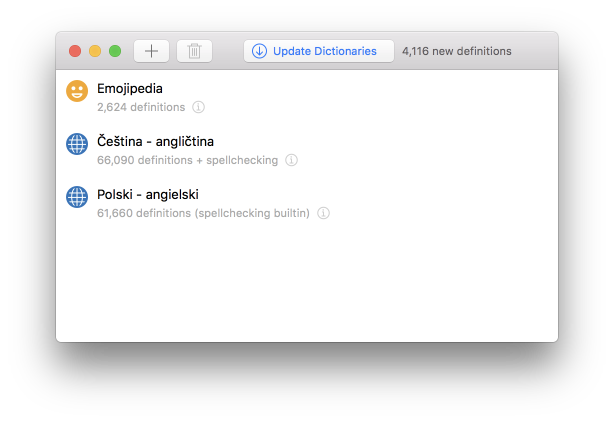 Dictionaries extends your Mac, by adding bidirectional translation, spellchecking and pronunciation for over 80 languages. Dusting off a dictionary or googling for a translation each time you find a word you don’t know yet can be time consuming. With Dictionaries, you are always a three-finger tap away from finding a translation in your native language. 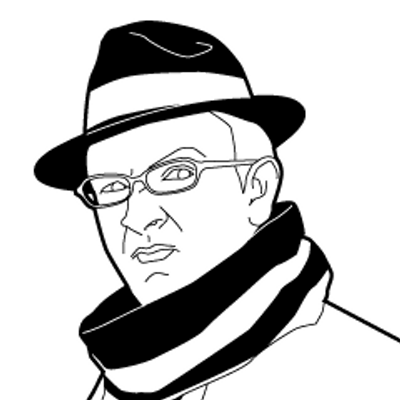 The days of having two separate dictionaries to do bidirectional search are over. Now, you can do it on the spot and the app will take care of making sure you have an accurate translation in front of you in a split-second. 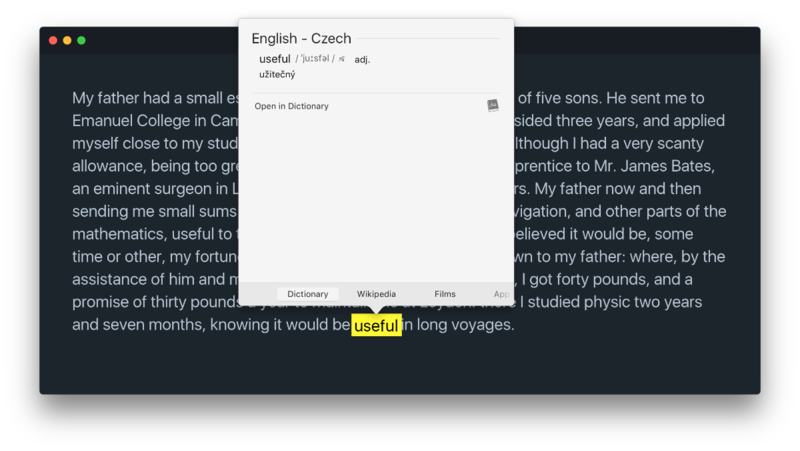 Thanks to its deep integration with your Mac, Dictionaries is able to provide the same translation capabilities across all apps that support macOS text processing. In addition, you can translate words directly from Spotlight. 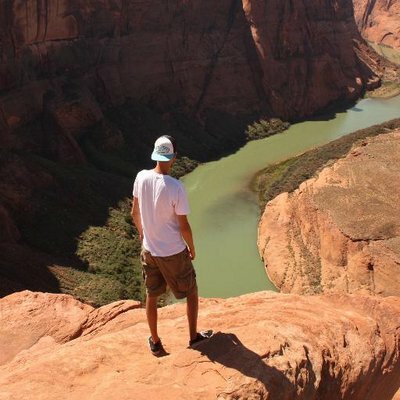 Includes Emojipedia definitions, helping you better understand the meaning behind emojis. A dictionary that’s always up-to-date and ready to use. By the time you buy a regular dictionary it’s already out of date. With Dictionaries you can launch the app once in a while and all installed dictionaries will update automatically. For free. Dictionaries comes with some awesome chops to help you find translations as quickly as possible. 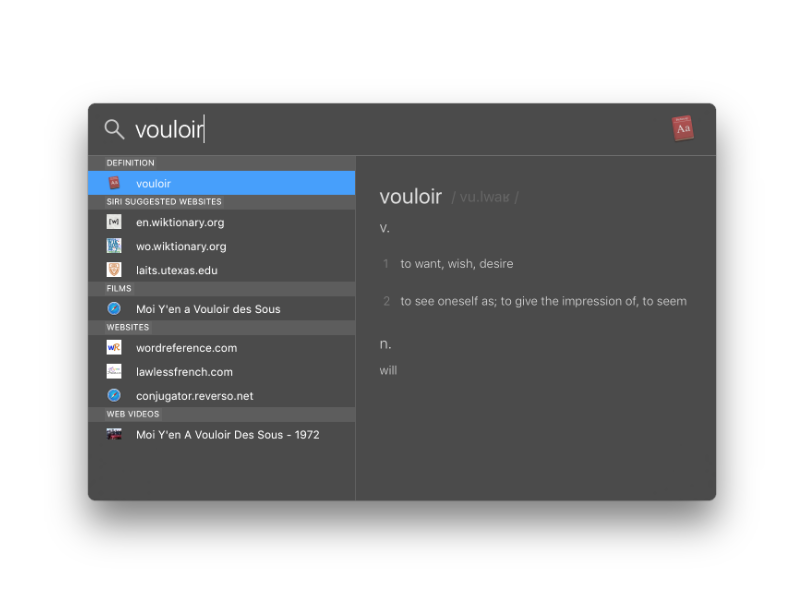 Seems obvious, but you can look up any selectable word you see across most apps, be it in a text editor, a web browser, or even typing it in Spotlight. If one is not already included in macOS, Dictionaries will install a spellchecking dictionary, to help you avoid sending that late-night email ful of speling mistaks. When you’re learning or practicing a new language, Dictionaries will help you correctly pronounce words and take your speaking skills to a whole new level. Join over 4,500 happy users.